The above info came from Who Wants to Know?, and was edited by yours truly (contact me). The image came from epguids.com. 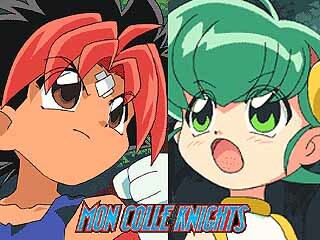 To protect Earth and the Mon worlds, Mondo and Rockna have paired together to form the Mon Colle Knights, protectors of the Mon worlds. Their mission is to locate friendly monsters and pit them against the forces of Prince Eccentro, who intends to conquer the Mon worlds and then use the monsters to rule the Earth.